If you saw my early April post, "Hatters Gonna Hat," you know how much I was looking forward to co-chairing a Mad Hatter themed "Through the Looking Glass Designer Tea" hosted by St. Margaret's Hospital Guild in conjunction with this year's Decorators' Show House and Gardens. All proceeds from the Tea and the Show House benefit Eskenazi Health and its commitment to serving the underprivileged in our community. 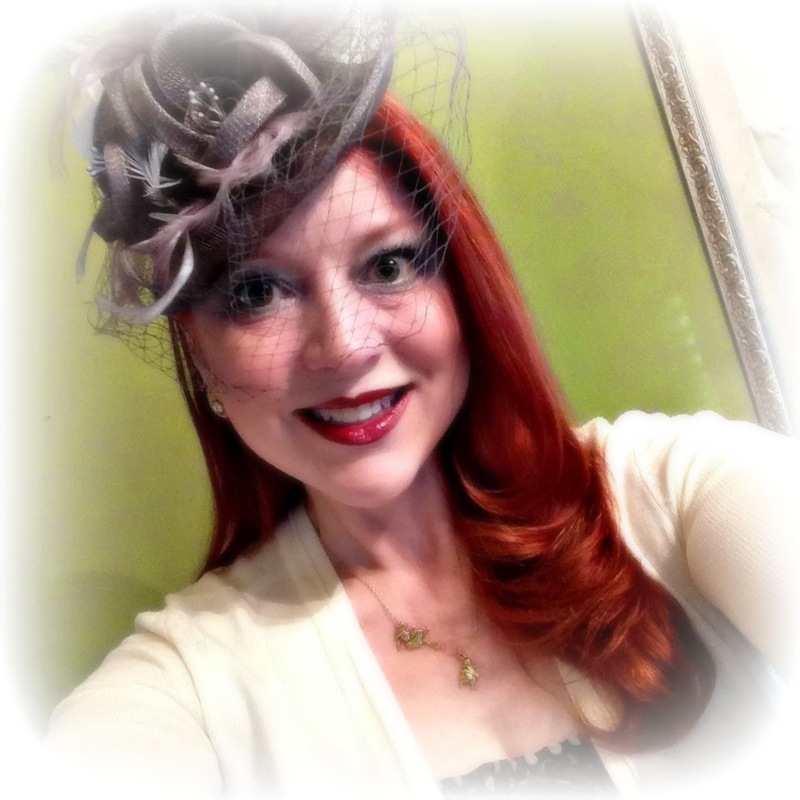 Hat (Amazon); For more swoonworthy hats, check out my friend Judith over at Hat Attack! In the past few weeks, I've truly felt like a mad hatter running around tending to last minute details to make sure our enchanted event on Monday afternoon was a delight for all 100 guests. I'm beyond thrilled to share that it was, by all accounts, a whimsy-filled Wonderland feast for the eyes, ears, and taste buds. I'll share all the little details in an upcoming post, documented in delightful technicolor by artist and photographer Faith Blackwell. 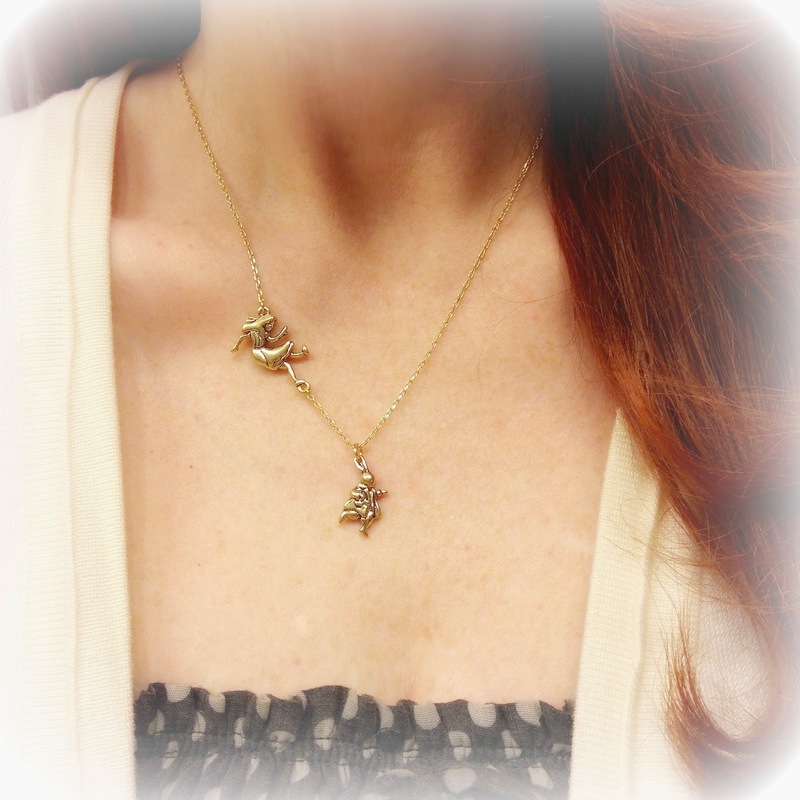 The Alice and White Rabbit Necklace was a Christmas gift. I love it! But, for now (and because I've been asked by several guests), I thought I'd share the details of my own "Through the Looking Glass" style. If you know me at all, you know I can't resist a theme...and I never do things half-way. I keep trying to get better about that whole "moderation" thing, but I'm failing miserably. For this look, though, every single element was already in my closet. The dress, Irregular Choice shoes, and tights were all acquired at different times, but coincidentally are all from ModCloth. Yes - I said tights. 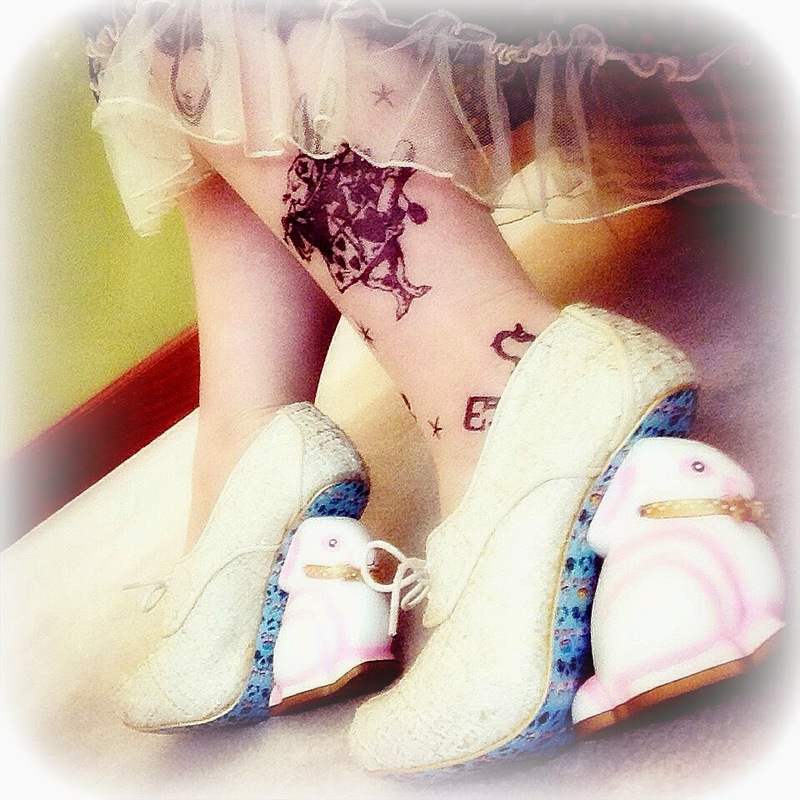 Even I draw the line at getting themed tattoos just for a party - but those Alice in Wonderland characters on my calves certainly fooled a lot of people! Are those tattoos or tights? The Alice and White Rabbit necklace was a Christmas gift from my in-laws, and while I wear it for other occasions, too, it was a "must" for tea. The hat is a simple, inexpensive fascinator from Amazon, with a few additional floral embellishments added with a hot glue gun by yours truly. 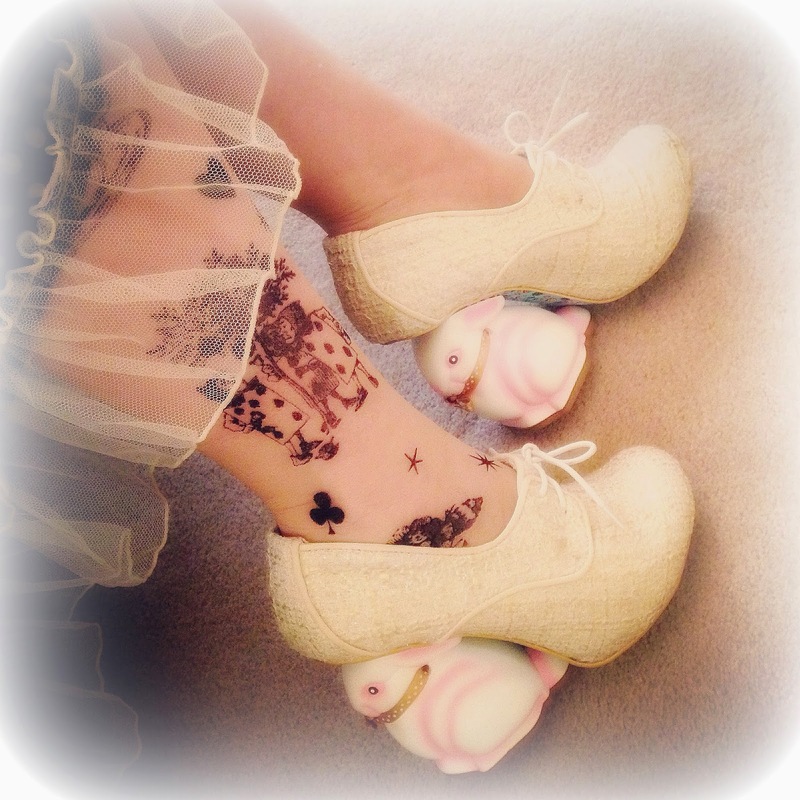 The White Rabbit shoes from Irregular Choice were the piece de resistance. I was thrilled to see many of our guests embracing the theme, as well, and seizing the opportunity to sport Spring chapeaus of all shapes and sizes. I can't wait to share their Wonderland "madness" with you soon! The vintage earrings belonged to my Grandmother Dorothy. She's always with me, one way or another, when I throw a party! Adorable outfit. It must have been so much fun putting it together. Would love to see that hat worn with a basic menswear suit. 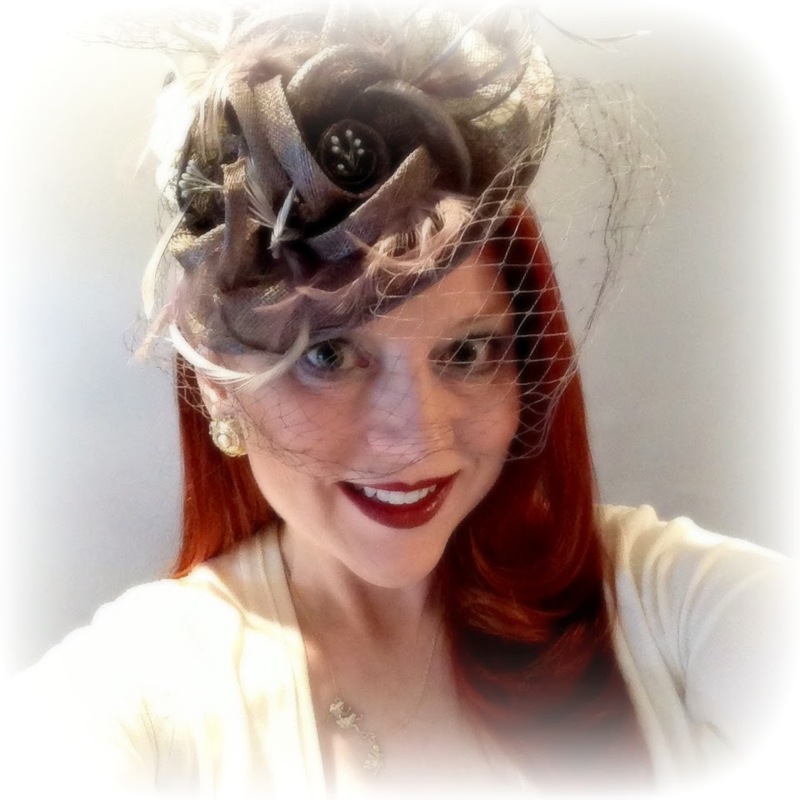 A swoonworthy fascinator is next on my list,too! Thank you, Marea! I love the idea of a fascinator with a pinstripe menswear suit, such a fun twist! A gorgeous fascinator! I love a veil and you wear this headpiece with panache. 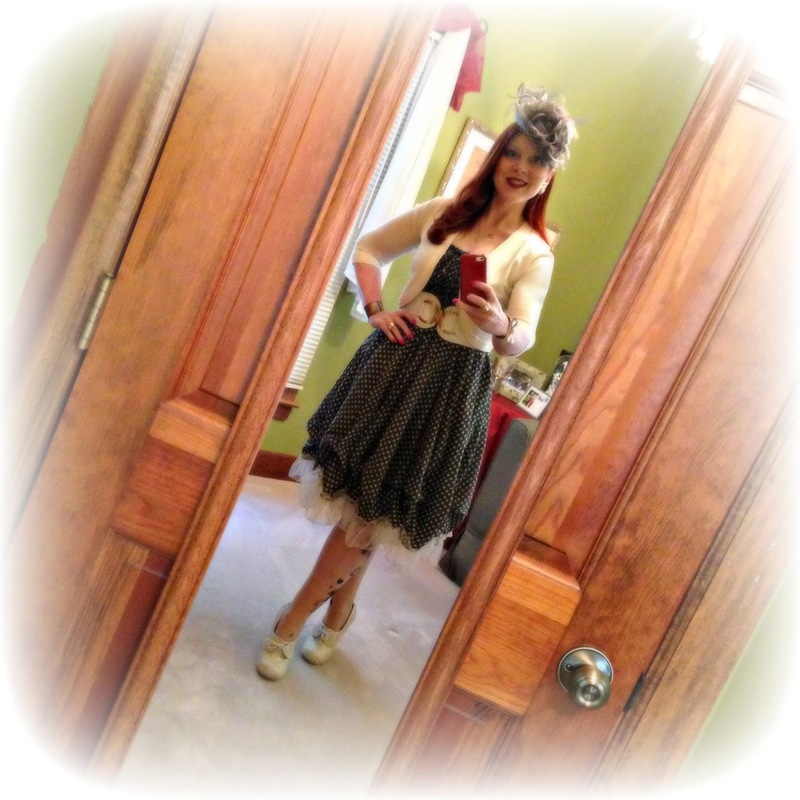 You are the perfect person to put together a Mad Hatter event. Thank you for sharing with Hat Attack!